Two weeks ago In the first half of this blog I described Egg Hoppers, a delicate Sri Lankan pancake made into a crisp basket cradling an eggy treat. 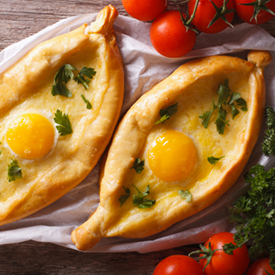 Now we move around the globe to the Eurasian country of Georgia to find the hearty Khachapuri, essentially a cheese-filled bread. It’s one of Georgia’s national dishes but is also popular in surrounding countries. In fact, although the origin of Khachapuri is not in dispute, it’s so popular in Israel that it’s considered an Israeli dish. That’s not unlike Americans thinking of French fries (claimed by both Belgium and France) as ours.